I have written earlier how a letter, found in a small museum in Montana, had inspired the writing of my novel « The Legend of Little Eagle ». This letter, dated 1947 and sent from France, was intended to thank the family of a young US pilot, LeRoy Lutz, for his heroism. In June 1944, he had sacrificed his life to avoid the death of innocent civilians. This letter, written by the secretary of the Mardeuil municipal council, in the Champagne region, never reached the Lutz family. It was only in 1995 that they learned what had happend to LeRoy, thanks to the efforts – over 50 years – of André Mathy, who as a child had been an eyewitness of the accident. I have written a novel whose hero, apart from being a pilot who encountered the same fate as him, has nothing to do with LeRoy’s Lutz history. Rereading it, I realized that beyond the pages describing the youth of John Philip Garreau, his training as an aviator, his missions above Germany and France, the underlying theme of this story is : destiny. Johnny Garreau is a mixed blood Indian, the great great son of a French immigrant who had settled as a trapper in 19th century Montana. His destiny will be to fight the Germans, who occupy the country of his ancestor. Recently, I got a message from Jerry Lutz, a nephew of LeRoy who lives in Lincoln, Nebraska. He had just discovered my book and wanted to thank me for writing it from the tragic episode mentioned above. And he took advantage of the occasion to offer me new information about his uncle. The Lutzes, of German origin, had been established for several generations as farmers in Russia. They had fled the chaotic conditions of this country in 1912 to settle down in the United States. They had 13 children, including 6 boys. Four of them served in WWII, and all returned unscathed but LeRoy, whose own destiny, as a German American, was to fight the Germans in Europe, like Johnny Garreau. And Jerry Lutz gave me another bit of information which to me has to do with destiny and coincidences : LeRoy, he said, had had a son after his death. Like Johnny Garreau in my novel, something which suddenly changes the life perpectives of several of the novel’s characters. (In a following message, Jerry, who had meanwhile checked about that, corrected : the boy in question, also named LeRoy, was actually born 8 days before the events in Mardeuil, but LeRoy had probably not had the joy to learn of this before dying. But this doesn’t matter. I find that fiction and reality meeting this way is something wonderful for a writer. 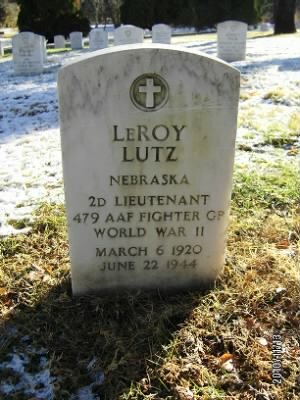 My name is Jerry Lutz, and I am the nephew of LeRoy (Lear) Lutz, who was the US pilot killed near your home on June 22, 1944. I know that you witnessed the crash, and I am writing to thank you for the extraordinary efforts to which you went in order to contact our family, and relate to us the story of my uncle’s crash. I hope that you will forgive me for not writing to thank you sooner. Out of common interest, Jerry and I have shared a lot of valuable information over just a few days. Including some developments about the 1947 letter from France I had found in the Ninepipes Museum of Montana. Its content, describing accurately LeRoy Lutz’s behaviour and actions at the controls of his P-38 which had been hit by the German flak, got engraved in my memory, but it was no more on display in the museum when I returned there two years later. It had been returned to the daughter of Arnold Helding, another pilot in LeRoy’s fighter group, who had a plane named « Lucky Lady ». Ironically, it was LeRoy who flew this aircraft on that fatal day of June 22, 1944, hence a deep confusion, apparently, about who was at the controls. And now Jerry tells me he has e-mailed the Ninepipes museum, and that they told him they had a copy of this letter. I gave him the name of Linda Helding, who lives near Ninepipes, and he plans to contact her for a meeting on a trip next spring to Montana. They will have things, stories to share. All seems to come full circle. As I’m polishing a bit this post today, I see on my Facebook page that Linda Helding has shared it. Wonderful ! All this brings me back to William Kittredge, a Montana author whom I quote on several instances in « The Legend of Little Eagle ». Stories, he said – no matter where they come from, wether they are true or fictional – acquire their value when they captivate your sensibility, touch your heart, and sharpen your curiosity. (…) A story is something which connects, which enlightens. It can also, sometimes, be a source of healing. A wise friend once told me that, when faced with a difficult choice, the hardest option is usually the correct one. Certainly, the choice between saving one’s own life or the lives of others is the ultimate example of that. I marvel at the courage displayed by my uncle 71 years ago when faced with that decision. Thank you so much for preserving and sharing his story! In many instances, fighter pilots did not have to make a decision: it was too late. They were killed. By the enemy’s fire, by friendly fire, or in accidents. In great numbers. There is testimony of that in the chapter « Into the Fight » of that link I ran into the other day and that I forwarded to Jerry Lutz. These are extracts of a book on the 479th Fighter Group, LeRoy’s unit. Jerry, who was unaware of its existence, immediatly bought the book and recognized LeRoy on top of a wing of the « Lucky Lady » in a group photo. Reading it, he will understand even better what his uncle went through as a fighter pilot. A path through hell comparable to that of many others, but finally different by his decision, full of altruism and spirit of sacrifice. My narrator, Hélène Marchal, owes him her life. The Lightning P-38 that LeRoy Lutz used to fly was a beautiful, fast, heavily armed, powerful beast. It was one of the fastest aircrafts of the time and was mostly engaged in planes interception, photography flights, and strifing targets on the ground. The Germans had nicknamed it « the fork-tailed devil ». I’ve read somewhere that only a dozen of them where still in flying conditions today. Including this one, beautifully restored. Ce contenu a été publié dans Aviation et pilotes, The Legend of Little Eagle, Tout le blog, avec comme mot(s)-clé(s) 479th Fighter Group, aviation, France, LeRoy Lutz, Lightning P-38, montana, Nebraska, Ninepipes Museum, pilots, US Air Force, USA, WWII. Vous pouvez le mettre en favoris avec ce permalien.